Watch Crayon Shin-chan Movie 19: Arashi wo Yobu Ougon no Spy Daisakusen full episodes online English Sub. Synopsis :Comical action spy film including an indecent material (flatus) and a story of a girl who had obeyed her parents, but becomes self-aware. A mystery spy girl Lemon Sunomono suddenly appears in front of Shinnosuke, and she calls herself an emissary of Action Kamen. She had trained as a spy by her parents in the Sukashipestan Republic, and works for the Queens. 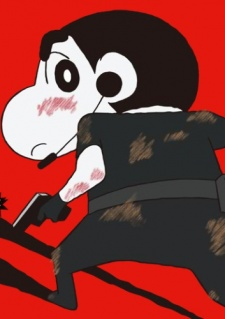 Under her guidance, Shinnosuke decides to be a spy to fight for justice, and receives spy training. Under the instruction of Action Kamen, Lemon and Shinnosuke perform a mission to creep into the laboratory in the Hedelna Kingdom and recapture a capsule from an evil professor, but Lemon finds the real purpose of the Queens, and they fight to foil the plot of the Queens.